"Is precognition a prescription for happiness or disaster? The Timeless Trilogy heroines, Kristina, Veronica and Cassandra, each deal with paranormal abilities as they discover and rediscover eternal love." In this novel we meet Kris, her two best friends, Roni and Cassie; Nick her ex-collage love who has after ten years believing her betrayal and her his, found the truth under lies and have been reunited as he moves in next door. 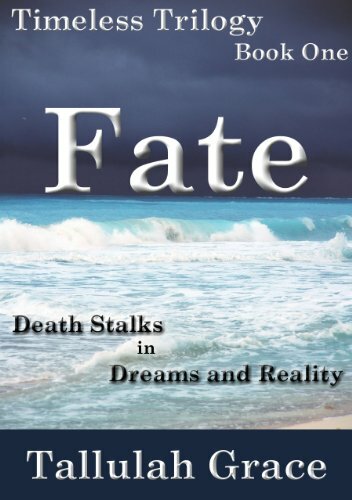 It seems like fate but they soon a serial killer is stalking Kris (or Krissy to Nick) and they must fight harder than ever in a seemingly helpless situation to be together. We also meet Dylan, a police officer and ex-FBI whom we learn only a little about but I have hope that he may be in the next book in this trilogy so we can learn about his past. I really liked Kris as a character, she was likeable, caring of her friends and you could really feel the connection between the three; almost as if they had been together for life instead of just since collage--ten years. Nick, I also liked he earned points as a character in my opinion for being able to cook; I do love a male character who is comfortable in the kitchen. ;) Also you could tell even if it were not for having some of his point-of-view that he really cared for Kris even after the years that had gone by since they last seen each other. I have to admit that at first I was disappointed that I may not be able to really get into this novel. Not because of the plot, which I liked, but because of the switching between characters so unexpectedly. One minute we might be on Kris's point-of-view the next we may have Nick's, Roni's, or even Dylan's point-of-view and so on. Like I said at first it bothered me, but after reading a little I found that I got used to it and kind of liked knowing what was going on in her friends head’s. Another thing, not something that really bothered me per-se but something I thought would have made the novel even more suspenseful is if we had not had so much of our bad guy's point-of-view. It was interesting but at the same time, again I think it would have made the novel more suspenseful if we had not had so much of his POV or at least not so much information from him when it was. Maybe if it had been slight snippets--but we really get a lot of information from him that in my opinion took away from the novel at points while reading. Overall though I did enjoy the read it was a good first novel in the trilogy, giving us a lot of information about our next main characters in the next two, Roni and Cassie and I look forward to learning what will become of them.